Traditional notebooks seem to be a thing of the past; it’s much easier to jot down important notes on a smartphone or tablet rather than worrying about carrying around an extra item. 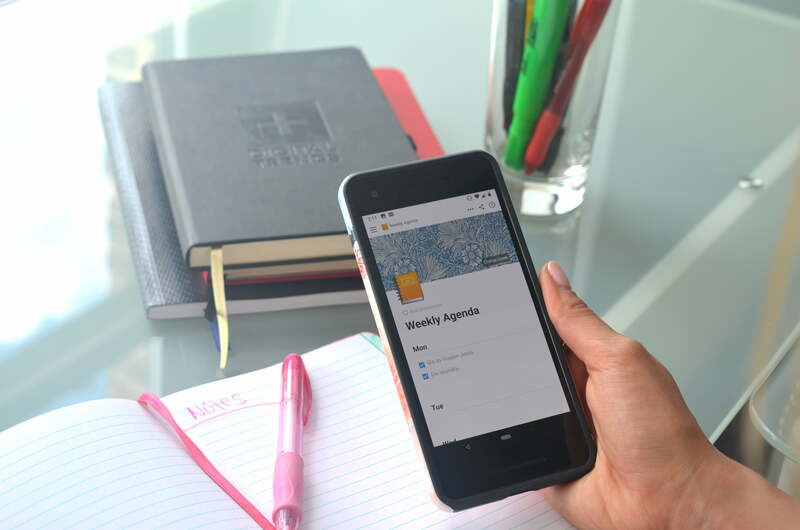 But for those who find notes scattered in random places throughout their devices, we have an app that can help you stay organized. Very organized. 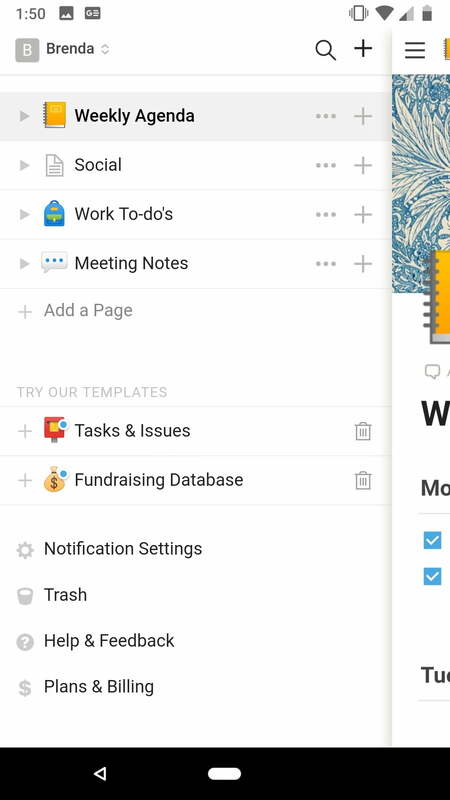 Notion is a productivity tool that’s been around for both iOS and on desktop, but has recently been released on Android. 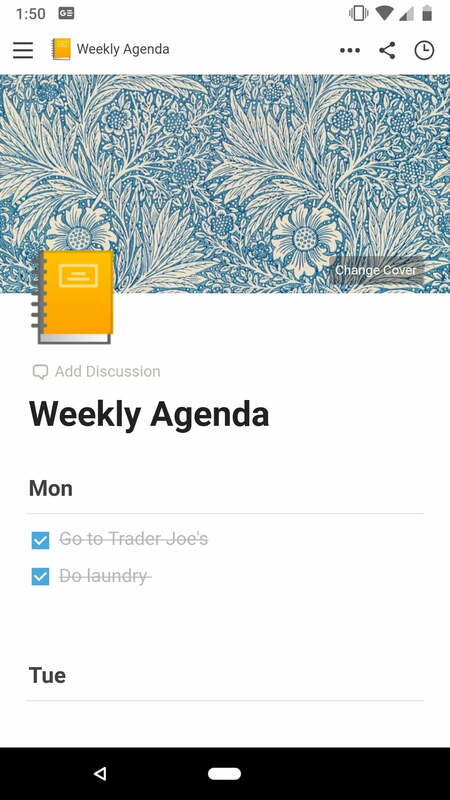 With Notion, you can take notes, create to-do lists, and keep tabs on tasks or projects. But it does so in a way that gives users what seems like an endless amount of possibilities, offering tons of different customization options and capabilities. Each part you tailor within a specific document is referred to as a “block” — such as block color or transformative block. As with other note-taking apps like Evernote, Bear, and Onenote, I wouldn’t recommend Notion for casual notetakers. When I first downloaded it on Android, it felt intimidating. While it does take you through a tutorial, it still took a bit of time to adjust to the all the different features. 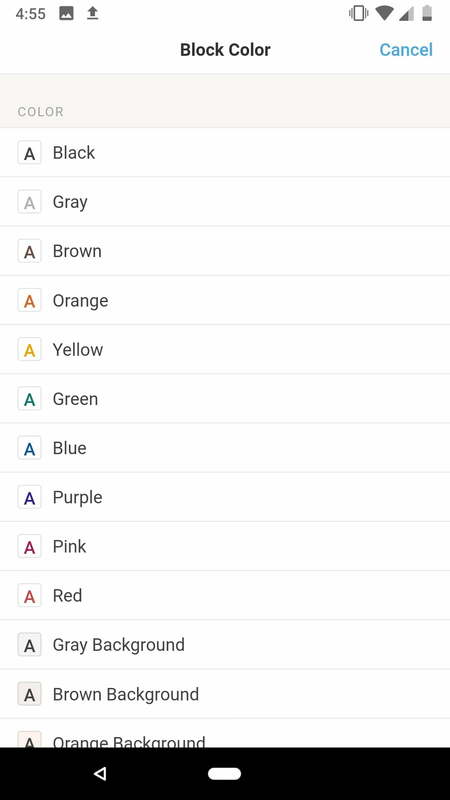 As I explored all the layouts, color options, calendars, and spreadsheets, I couldn’t help but think back to those people in high school who would color code their planners with all the colors of the rainbow. To start, you can either choose to fill in your own empty page or pick from one of the many templates Notion has to offer. Since I’m not the type to pay too much to detail when it comes to my notes, I chose to keep track of everything through templates. 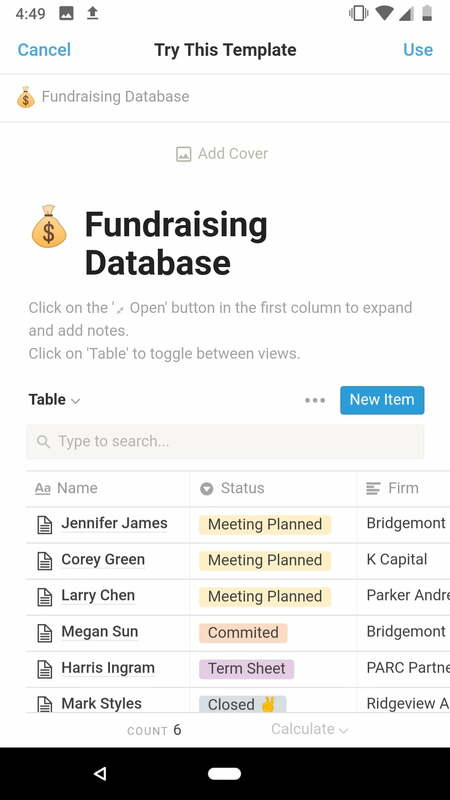 They’re all separated into different categories: Notes & Docs, Knowledge Base (mainly for office teams), Tasks & Projects, and Database & Spreadsheets. I specifically used Notion to keep track of all my to-do lists, both work and personal. Under my “Weekly Agenda,” I listed all of the errands I wanted to get done before the end of the week, and under “Work To-do’s,” I wrote down the assignments I had on my plate. It was also fun to be able to customize it with different cover photos, or choose what kind of list (bulleted, toggle list, sub header, etc.) I wanted under each day. By the end of the week, I started to realize why it was so important to have these options — it makes those dreaded long lists a bit more enjoyable and soothing to look at when every minor detail is aesthetically pleasing. 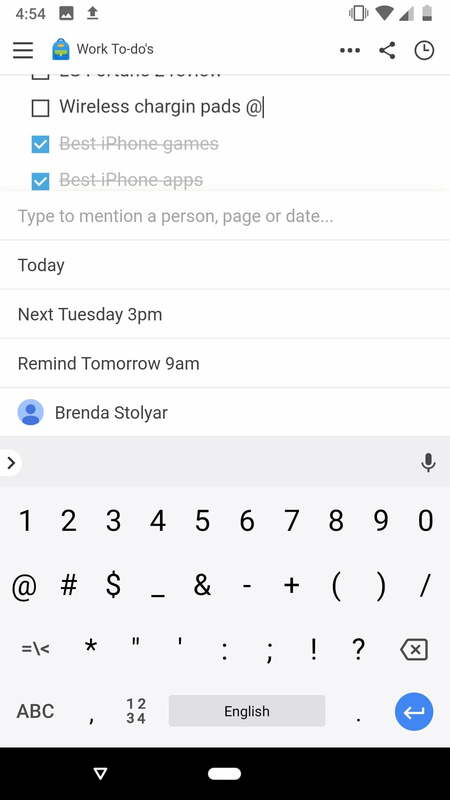 The interface is also a refreshing change from some note-taking apps on the market that can look a bit bland and washed out. When you create specific documents, they’re all saved in a sidebar separated by emoji-like icons. For instance, under Weekly Agenda there’s a bright yellow notepad and the Work Agenda document has an adorable blue backpack. 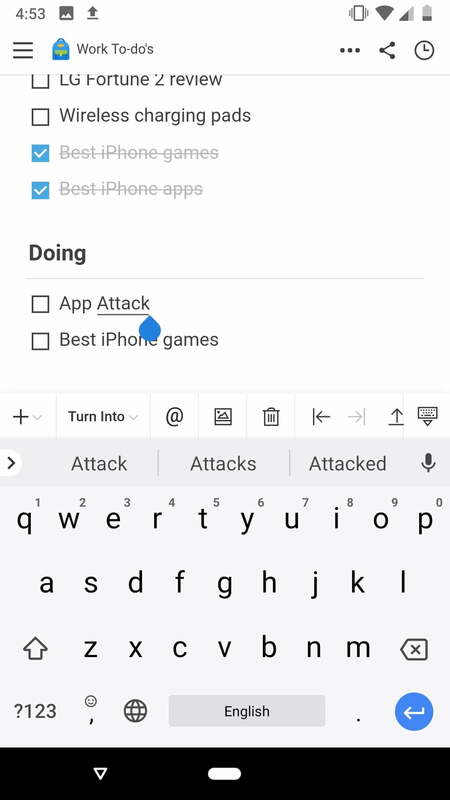 Navigating the app can be a bit frustrating at first, since there are so many things you can customize and tap through, but I was able to get the hang of it after a while. After tapping through and making yourself aware of all that there is to offer, you’ll eventually start to memorize the steps and will have a clear idea of what you want to add as soon as you open the app. 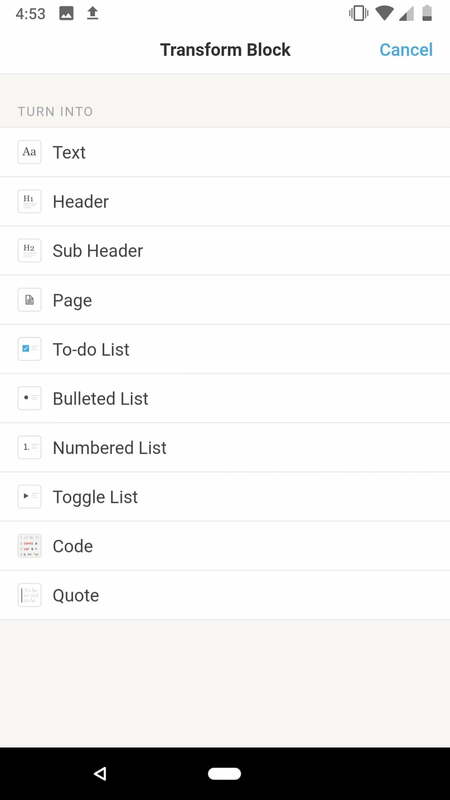 You’re also able to use drag and drop or Force Touch to rearrange your content, which came in handy when I wanted to switch certain tasks around to different days. Users can sync with Mac, Windows, and the desktop app in order to keep all of your notes and lists easily accessible no matter what device you log into it on. For times where you’re on the go and don’t have access to internet, pages are also downloaded for access when you’re offline. While it is available for everyone to download, I’d definitely enjoy using it more if it was for work as well — which would then make more sense for me to also incorporate my personal life into. 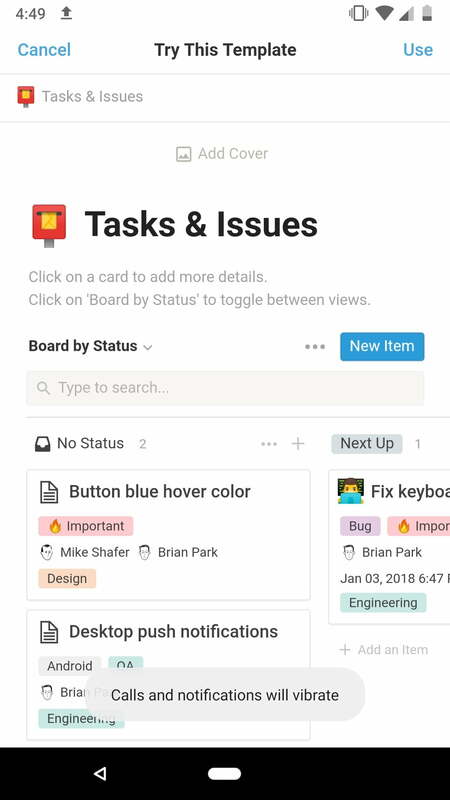 Templates are available to make workflows easier — ranging from those that allow you to organize tasks and the status of bugs, or one where you can create an entire database complete with color codes. With a collaboration feature, you can also share pages, edit at the same time as others, add comments, and mention people by tagging them on certain documents. You can also attach documents you make in Notion into other ones on the app to keep everything compact and in one space. As an office productivity tool, it’s a great and intuitive way to keep everyone on task and organized even when there’s a lot going on. 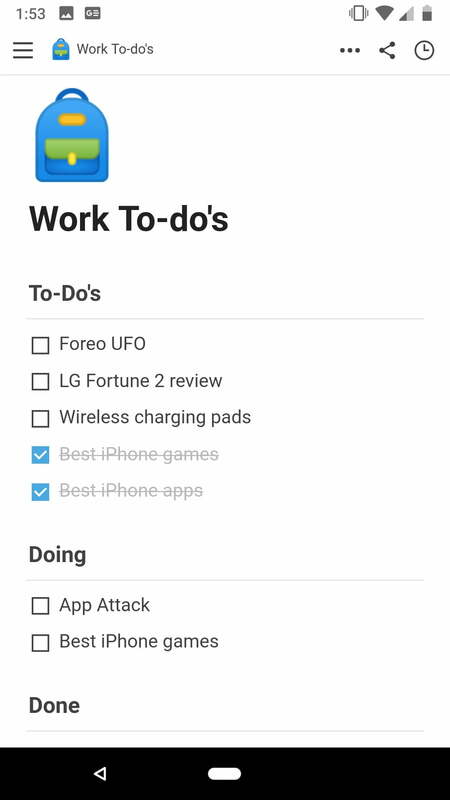 For personal use, I think I’ll stick to Google Tasks, which isn’t too feature-packed but gets the job done when I want to quickly jot down notes. Since it’s stripped away of any complex customization options, I have no choice other than to type in the information and tap “done.” Whereas with Notion, just when you think you’ve reached the end of all that you can add to one document, you find even more. Notion is free to download on the Google Play Store as well as on iOS and desktop. But if you want unlimited storage along with additional features and permissions, Notion offers a variety of plans starting at $4 per month.